I have been pulling out my suits more often lately, and have fallen in love all over again with the sense of confidence and pride in your appearance that a quality, great-fitting suit with all the trimmings can bring. My particular fancy right now is the 2 button SB peak lapel with side vents & hacking pockets (ticket pocket too)– and there must be a beautiful, soft roll to the lapel. Very Jimmy Stewart in Rope, circa 1948. In need yourself? Stop by Paul Stuart. 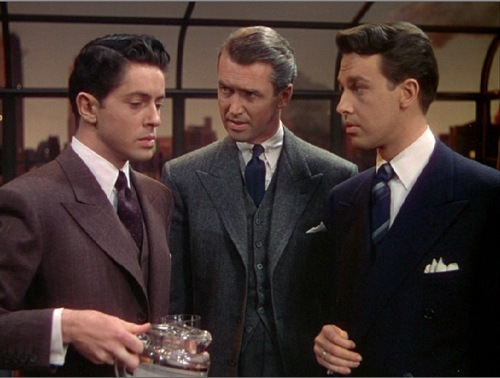 While Jimmy Stewart’s style in clothing was worth note, even more impressive was his personal character and honor. He was a man’s man, who didn’t shirk responsibility or run from his commitments. I admire that. I want to be that guy. 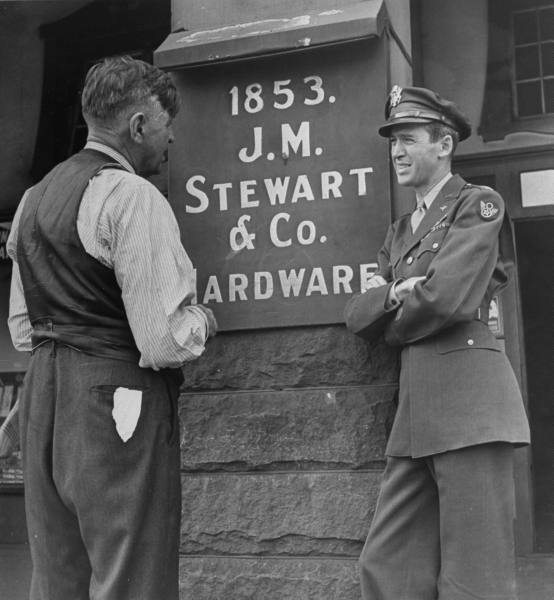 Jimmy Stewart and his father Alex in front of the family hardware store, 1945. 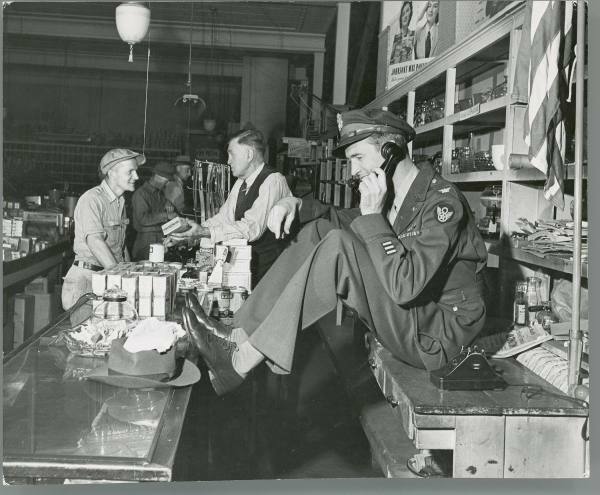 Jimmy Stewart feeling very comfortable inside the family store– father Alex in the center of this pic. 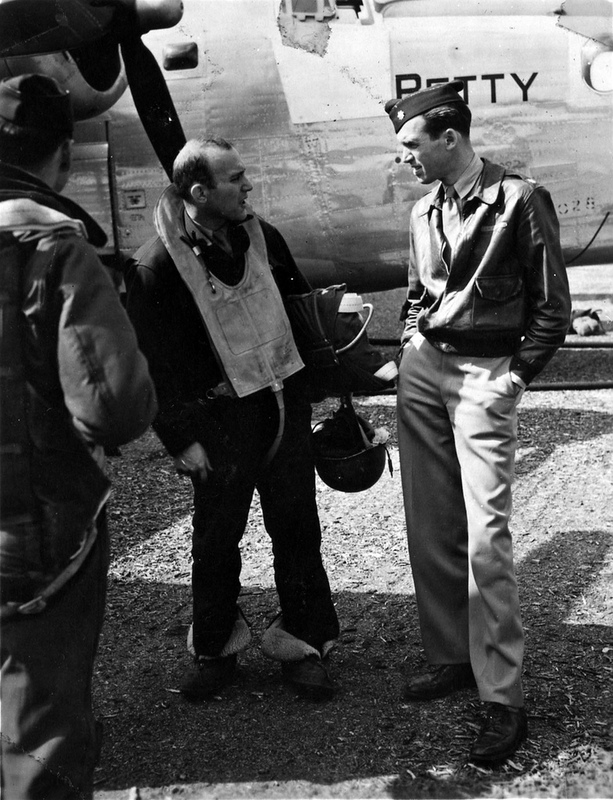 On top of being one of the the best-loved actors ever, Jimmy Stewart was a also Princeton-grad architect, an accordion player, and a WWII bomber. AKA– a stand-up guy, and the all-around perfect man. Feeling like I haven’t done much over here. 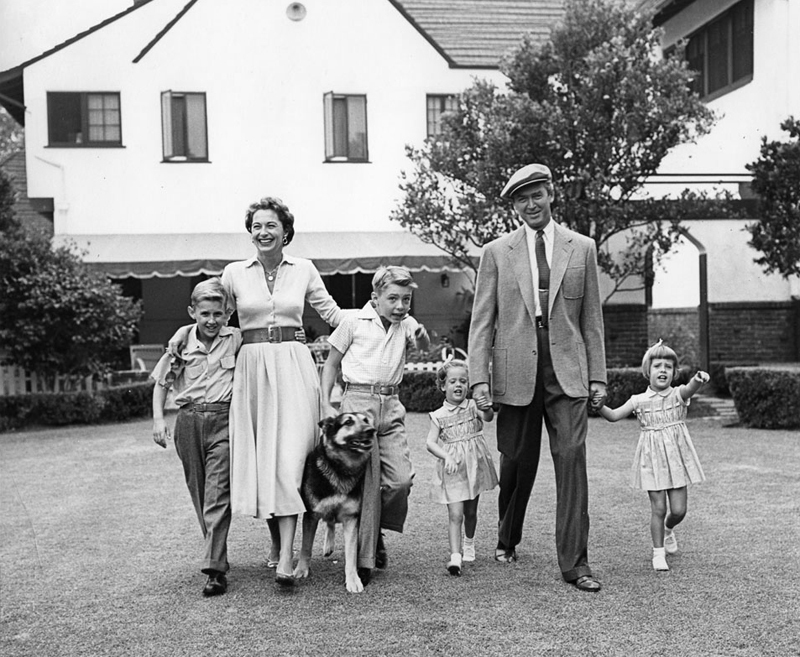 Jimmy Stewart the family man, for Bazaar circa 1956. This entry was posted in American, fashion, history, Icons, movies and tagged American, apparel, classic, clothes, clothing, fashion, film, icon, jacket, Jimmy Stewart, legend, photo, picture, star, vintage. Bookmark the permalink. THAT’s what I wish our family looked like…neat & happy. Such class. I feel this stand-up guy category would also very well apply to Gregory Peck. A great post – It seems like the only men who become actors in the States anymore are comedians or men, who when they were 13, were obsessed with Broadway shows. 2 members of the crew, J.C. Smith and D. Redd, of the Betty Jane were helped by my father and aunt. The landed near Wormerveer and J.C. Smith was thrown into the arms of my aunt Nel Boot. With the words: you’ll probably know what to do with him. I enjoy it very much to find some information about the plane and crew.